Like a quilt, Gathering Friends Quilt Shop is the joining together of unique parts to create something wonderful. A place where our passionate staff, friends and customers gather to share, learn and laugh. Tucked inside a quaint 1902 Historical Building on 101 S. Main Street in Bird Island, Minnesota you’ll find 3 buildings filled to the brim with fabric, notions, books, patterns, kits and one-of-a-kind gifts. Gathering Friends Quilt Shop owners and sisters-in-law, Kathy Squibb and Deborah Jacobs are avid quilters and create kits, designs and have written a wide variety of pattern books to inspire and encourage quilters and soon to be quilters everywhere. For over a decade, Gathering Friends Quilt Shop has truly lived up to its name as a place that is truly a gathering of friends. Find Gathering Friends Quilt Shop on Facebook. 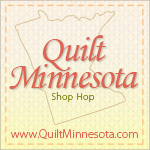 Chosen one of the Top Ten Quilt Shops for 2011 by American Patchwork and Quilting.